Next month will mark one year since the people of Japan experienced a devastating series of natural disasters. The earthquake and tsunami that hit parts of Japan on March 11, 2011, resulted in tremendous loss for the Japanese people. Many Japanese lost their lives while survivors lost homes, a sense of stability, and sense of place. Personal items and familiar places tied to memories of home and loved ones were destroyed during the earthquake and tsunami. Places were erased and the ability to recall – to feel at home – disappeared under rubble and waves. 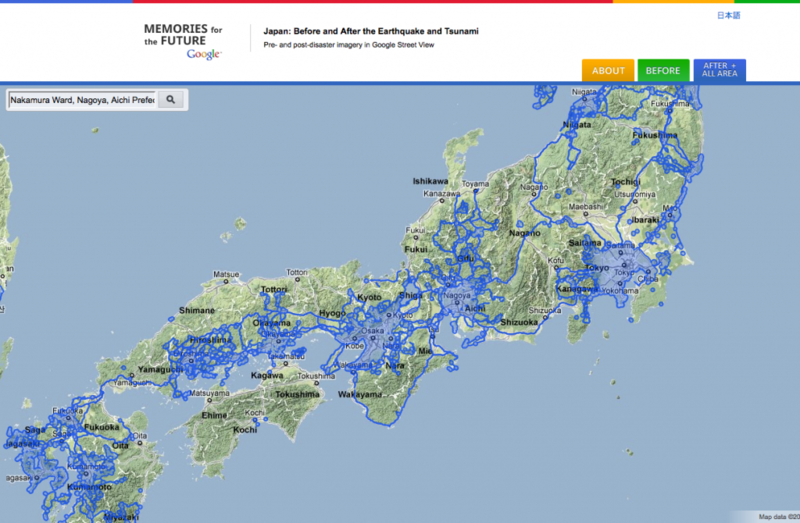 To assist those affected by the disasters in Japan, Google is undertaking a really interesting project. Part of this project is the creation of a collaborative website called Mirai e no Kioku, which gives Japanese people and survivors the opportunity to post and share photographs, videos, and memories related to places as they were prior to the disasters of March 2011 (media and website only available in Japanese). Another interesting aspect that non-Japanese speaking people can participate in is a re-visualization project initiated by Google, which offers users a chance to re-experience places through archived street view footage of affected areas. The site uses Streetview data to populate an archived digital landscape for the user. The interactive map of Japan allows users to choose either a before or after street view of several locations across the country (note some areas are archived more thoroughly than others). In the About section of the website, places such as Ishinomaki, Onagawa, and and Soma are identified as areas that were significantly affected. Users can explore these regions while navigating virtually along roads and highways, slipping back and forth through time with before and after views. The Memories for the Future project along with the interactive map, are two great examples of how collaborative technologies can serve local communities in archiving and recalling private and collective memory(ies) following traumatic events. In an effort to promote healing, users participating in Mirai e no Kioku website can archive and share private memories of places, people, and experiences through cultural media – literally chronicling their ‘memories for the future.’ Google maintains that “seeing the street-level imagery of the affected areas puts the plight of these communities into perspective” and that this project “ensures that the memories of the disaster remain relevant and tangible for future generations.” Despite users being physically separated from the ‘real’ places they seek to revisit in the Streetview maps through their computer screens, there is something to be said about re-visualizing past places. Some people, such as myself, doubt the ability and ‘authenticity’ of revisiting and recreating past places through augmented reality. While I won’t get into this debate here, I wonder if we can truly revisit the recent past through digital projects such as the Streetview archive? What if you are not a stranger to the past, and what if the virtual places you seek to revisit are familiar? The Memories for the Future project is similar to the Arcade Fire website The Wilderness Downtown created for their music video “We Used to Wait.” The user enters the street address of his or her childhood home and the site will use Streetview and Google maps data to populate an interactive music video. While listening to “We Used to Wait” you can re-visualize your childhood neighbourhood as it exists today. Drawing on notions of nostalgia, both the song and the video are re-narrated through the experience of the user. Similarly, users of the Memories for the Future website are given a chance to revisit (albeit visually) familiar places before they were destroyed, and through this process, users can create their own narratives of place. I can also get a sense of the damage by using the before and after views. Although I am not personally affected, the sense of destruction becomes very real and I am saddened while viewing homes missing from the spaces they once occupied. Buildings and homes disappear with the click of my mouse, and the sites they used to occupy transform into disorienting and chaotic digital landscapes. Before March 2011 Earthquake: Ishinomaki, Miyagi Prefecture, ©Google Image Data, July 2011. After March 2011 Earthquake: Ishinomaki, Miyagi Prefecture, ©Google Image Data, July 2011. In terms of living memory, digital landscapes can offer individuals the opportunity to recall memory of places that no longer exist. Lost places and childhood homes cannot be re-experienced entirely; taking into account sensory experiences involving sounds, smells, and touch remind us that there are limits to revisiting past places. Memories cannot be re-experienced. But through sight there is the ability to recall, something that is significant when taking into account that for the Japanese who lost their homes, their personal items and ‘sense of place’ were altered or destroyed. Memories for the Future demonstrates how collaborative new media and digital landscape projects have something to offer individuals, communities, and heritage groups when it comes to archiving visual components of past places. These digital initiatives also raise some interesting questions about memory, archiving Google data, and placemaking through public collaboration.